STEVENSVILLE — The life of a firefighter demands endurance and is fraught with danger. No one understands this more than Brandon Chiarello, who by day, works as a parts consultant at LeValley Chevrolet in Benton Township. 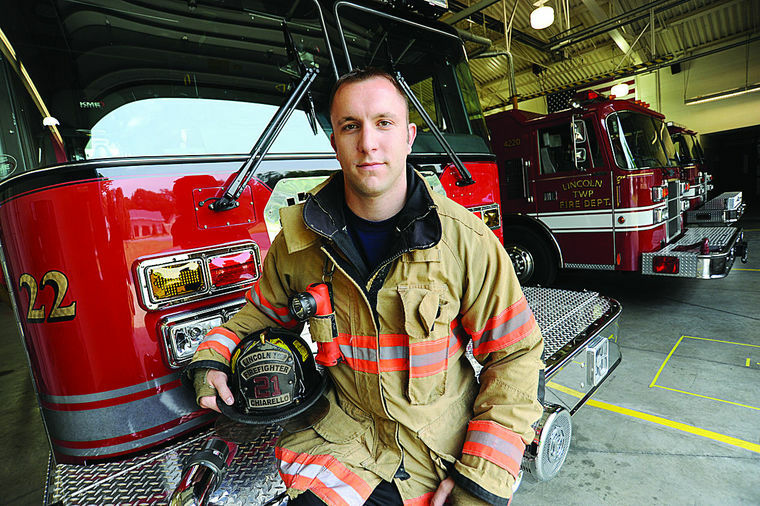 After regular work hours, the Stevensville resident is a member of the Lincoln Township Fire Department and is intent on completing a goal he has set for himself. For the last two years, Chiarello has been participating in the Scott Firefighter Combat Challenge, which pits him against the clock and firefighters from across the country. Chiarello, who has been an LTFD firefighter for five years, set out to complete the course in record time. His fastest time so far is two minutes, six seconds. The state record is one minute and 50 seconds. “The competition hits all aspects of firefighting,” Chiarello said. The challenge consists of five grueling events. Firefighters start by carrying a hose called a “high-rise pack” that weighs 42 pounds up a five-story tower. When they reach the top, firefighters then hoist a rolled-up hose with a rope from the ground. After they finish, they move to the forcible entry prop, where they use a 9-pound mallet to drive a 160-pound sled down a track. In the third event, competitors negotiate a 140-foot slalom course, moving quickly between fire hydrants. Then comes the hose target portion, where a fire hose filed with water is dragged 75 feet before the water is sprayed at a target. All of these events are completed with the firefighters in full gear, while wearing an air pack and breathing bottled air. Chiarello competed in Indianapolis and Lexington, Ky., but will next go to Louisville, Ky., on Aug. 21. He completed his first course in 2012 and said he came in unprepared. As the 28-year-old has repeatedly shaved seconds off his course time, he has continued to up the ante on training. The fireman lifts weights Monday through Friday, while Tuesday, Thursday and Saturday are reserved for endurance. Lincoln Township along with its fire department try to help Chiarello as much as possible, often supplying him with a vehicle and paying for his hotel rooms. Chiarello said without the additional help, he wouldn’t be able to compete. Lincoln Township Fire Lt. Griffin Ott said it’s worth it as Chiarello has proven to be the fire department’s main motivator for staying fit. Ott describes Chiarello’s training as intense. He said it is only a matter of time before Chiarello brings home the state record. As his training continues and the hours of preparation stack up, Chiarello said he has one other goal in mind. This entry was posted in (P) Herald Palladium, Articles, Features, Photo and tagged dummy, fire hose, firefighter, Herald Palladium, Indianapolis, Lincoln Township, Scott Firefighter Combat Challenge, Tony Wittkowski. Bookmark the permalink.